The Brazil nut tree is enormous, frequently attaining the height of 40 to 50 meters or more, and it can reach ages of 500-800 years old. The tree is found throughout the Amazon rainforest in Bolivia, Brazil, Peru, Colombia, Venezuela, and Ecuador. The fruit is a large, round woody capsule or pod, about the size of a large grapefruit and weighing up to 2.2 kg. The fruit pods grow at the ends of thick branches, then ripen and fall from the tree from January to June, usually with a loud crashing sound as they fall 150 feet through the canopy like cannon balls. Inside each fruit pod, wedged in like orange segments, are 12 to 25 Brazil nuts, each within its own individual shell. Mature Brazil nut trees can produce a range form 63 to 216 per tree annually. Most of the pods gathered in the wild are sent down river to processing plants were they are opened out of the pod and packaged. The trees grow very slowly, taking as long as 10 to 30 years before producing nuts, and they require a specific species of bee to pollinate the flowers. Both of these factors make the trees unsuitable and unprofitable for plantation cultivation. Uniquely, the Brazil nut is a huge source of the mineral selenium. They also contain: good quantities of vitamins and antioxidants. High content of healthy unsaturated fats. The comprehensive profile of vitamins and Nutrients in the Brazil nuts make it particularly good for protecting skin health & high level of selenium & antioxidants stimulate the immune system. Helps in proper function of thyroid gland. 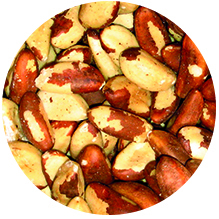 Brazil nuts have a delicate creamy flavour and can be eaten as a healthy snack. Additionally, they can also be enjoyed roasted, salted, or sweetened. When chopped, used in biscuits & cookies, puddings, pesto, chocolates bars and snack bars. Brazil nut oil is used in salad dressing and in cooking.